Skiing above Francie's Cabin, Summit Hut System. 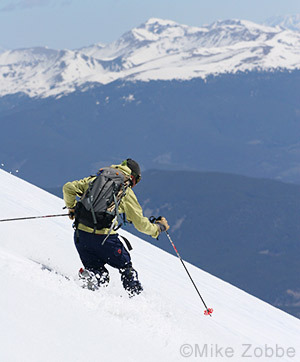 We have one purpose here, to provide you with information about backcountry skiing Colorado huts so your travels will be safer and more fun. We have a complete set of free topo maps and route descriptions ready for use, but changes and updates are ongoing. So check back often. Remember to use HutSki.com in conjunction with the 10th Mountain Huts reservations website. Use of HutSki.com requires a speedy internet connection due to our large high quality accurate topo maps. If you need our route descriptions for 10th Mountain Hut System and Summit Hut System and don't have a high speed connection, turn off image viewing in your browser. GPS tracks for selected routes. Of course the web has one problem when used for providing backcountry skiing information: You can't take it with you. Or can you? HutSki.com is designed to be printer friendly. All our website page content is the proper width to output correctly on any standard 8.5x11 computer printer; the same being true of our maps. More, we are well on the way to providing you with paperless mapping by providing digital versions of our maps, as well as GPS tracks you can load into a map capable GPS unit. Look for more about paperless mapping as this next season progresses -- great way to consume less and reduce your carbon footprint! And if you feel you need a book, may we recommend Warren Ohlrich's excellent and incredibly detailed 10th Mountain Division and Summit Huts guidebook, "10th Mountain Hut Book." As for the Alfred Braun Huts and Friends Hut, no detailed paper guidebook exists, so we make it our ongoing mission here to provide as much detail as possible about those huts. Please feel free to print anything you find on this website and use it to build your own backcountry skiing field notes. (Note, most inkjet printer ink is water soluble. For use in the field, at the least carry your print-out in sealed ziplock bags, or have them laminated. Best, use special paper (see link to right) that results in a waterproof printout. Black and white laser printer output is relatively moisture proof, but our maps are intended to be printed in color (though they'll function in black and white). Our content includes hundreds of route descriptions, numerous how-to's and a tileset of annotated topographic maps for the 10th Mountain Huts and Summit Huts that are accurate and free. Please enjoy. To leave comments and feedback consider using our forums (see menu above). 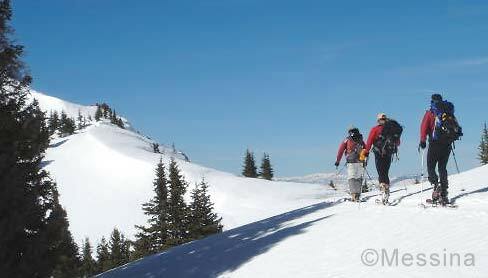 We trust you'll find HutSki.com useful for planning and completing your next Colorado hut trip!